In tracking some of the more obscure niches of the Japanese retro-bleep music scene, Monotonik has picked up a gem or two in the past (see: Blasterhead). And we’re pleased to say that we’ve struck oil again (or at least, some gushing black pixels) with the first album from Japanese duo Kplecraft, ‘KNMS-001’, a deliciously alternative blend of Game Boy bleep and jazz-techno improvisation. Here’s what you need to know. 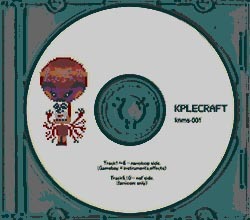 Kplecraft consists of Kuske (Nintendo Game Boy with Nanoloop 1.2, saxophone, effects, etc.) and Eddie (percussion, conga, etc.) It is, more or less, a bleep side project of the Japanese jamband PCIA, in a similar way, perhaps, that Eat Static and Ozric Tentacles interact, and oddly enough, it’s the blend of jamming and solid electronic beats that somewhat recall both of those bands, as well as other marvellous oddities like the Holistic Records crew from the Isle Of Wight. For ‘KNMS-001’, we start with the mechanical jolt of ‘Rupa’, all robot perfection before the echosaturated saxophone jamming kicks in, and its straight into the delicious mix of real instrument and robotic backing that permeates the entire album. Particular highlights? The rather beautiful, swirling melodies of ‘718 Suite: Part 1’, and the half bleep, half insane freak-out that is ‘NNNN’, before finishing with two songs that are .NSF (NES sound chip) only, with ‘8-Bit Goa’ a surprisingly expansive and fitting finish. Rock.